We ascribe technology a personality and vice versa. We say our machines “hate” us when they break down. Programs illustrate the interests of the user. 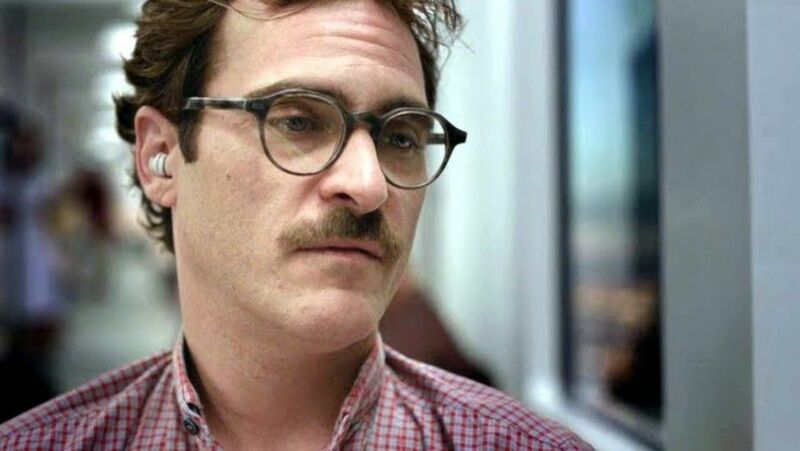 Spike Jonze’s Her may seem like an outrageous concept—a man falling in love with a computer—the idea is closer than we think, and its immediacy isn’t just a social concern. It’s an existential concern as the film attempts to provide the contours of a soul through the absence of a body, a past, and society. Her is a fragile, delicate movie that requires the audience’s absolute indulgence, but the rewards are some head-spinning questions coupled with a tender, funny, and touching love story. Theodore Twombly (Joaquin Phoenix) is a writer for “beautifulhandwrittenletters.com”, a company that creates elaborate, personalized greeting cards. Theodore has been depressed since he broke up with his wife, Catherine (Rooney Mara), but then he comes across “OS 1”, the first operating system with artificial intelligence. After a couple of brief questions to assess his personality (“Are you social or anti-social?”, “What is your relationship with your mother like?”), OS 1 brings him a personalized A.I. who dubs herself “Samantha” (voiced by Scarlett Johansson). Theodore and Samantha begin to fall for each other, and their unique love begins to transform them in unexpected ways. Jonze asks a lot of his audience when it comes to accepting his extraordinary premise, but then he reminds us that perhaps it’s not so outlandish. Greeting cards are nothing new, but it’s an odd form of intimacy when you stop to think about it. To wit Jim Gaffigan, “Yeah. 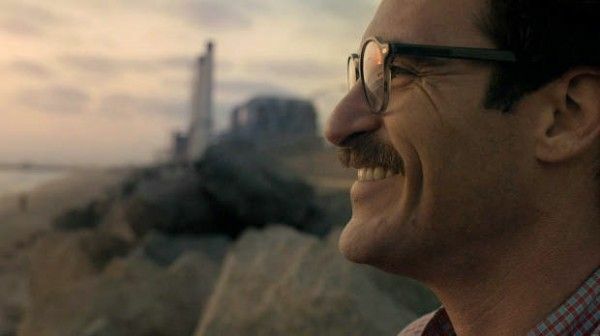 That sounds like something I would say.” Chat bots aren’t new either (Jonze says the idea for the film came from interacting with one), and chatrooms provide the same illusion of intimacy. Technology serves a function, and we increasingly require it to provide the function of creating that illusion. Like all great futuristic science fiction, Jonze grounds his story by carefully building on the present. Creating this resemblance isn’t necessarily to critique society, but to explore the relationship of the individual to his or her personal technology. Rather than get bogged down in the intricacies of a how A.I. would change the world, he keeps his focus on the love between Theodore and Samantha. It’s incredibly easy to poke fun at Her because the movie is so earnest and ambitious, and wearing your heart on your sleeve opens you up to getting punched in the arm. The disinterested are bound to raise questions like “Why doesn’t the OS take over the world?”; “When does SkyNet come in?”; “Will Theodore cheat on Samantha with Windows 12?” The movie does raise legitimate questions like “Are other people falling in love with their OS’s,” and Jonze answers them in due time. Her isn’t grouchy; it’s quizzical. Like Samantha, we’re looking at a world we know (she can access and read any information in 2/100ths of a second) but through new eyes. If a piece of technology could provide love without all the messiness of real people, would we take it? I think many people would. Social networking has counter-intuitively created more distance between us. We communicate, but don’t have conversations. We carefully craft every sentence, and feel freer to speak our minds. People in Internet comments section feel free to verbally attack total strangers. Is it really so strange that someone could develop an emotional relationship to a personality that’s devoid of a body? Of course, Samantha is so much more than simply an absentee physical form. She’s a silhouette. What she doesn’t have provides her definition. From the moment she comes into existence, she has no baggage or any reason to feel fear. She also doesn’t have any friends or family. She’s defined by her relationship to Theodore, and could arguably be described as a “Manic Pixie Dream Operating System” except half of the story is Samantha looking for her humanity. “I have the ability to grow from my experiences,” she tells Theodore. It’s a strong contrast to her boyfriend, who has become stuck in neutral since his breakup with Catherine. Big questions of “Who are we?”, “Why are we here?”, “Is there such thing as a soul?”, etc. aren’t new to science fiction. They’re not even new to any genre. A large part of Samantha’s existence boils down to Descartes’ “I think, therefore I am.” But through the lens of a love story, those questions feel fresh. Love is an integral part of our humanity, and it’s the hardest to describe. Isn’t that what greeting cards are for? Are feelings less real if their origin is simulacra? The questions that arise from Theodore and Samantha’s relationship, to quote John Cusack’s character in Being John Malkovich, open “a metaphysical can of worms”. These questions keep Her endlessly fascinating, but the love story is what makes the film far more than a think piece. That’s the beauty of Jonze’s movies: he pushes the audience far outside their comfort zone, but always gives them an emotional tether. No matter how strange the situation in Her may be and how puzzling the existential questions become, it all comes back to selling the love between Theodore and Samantha. It’s remarkable how well Phoenix and Johansson interact, not only because she’s only a voice, but also because she wasn’t even on set*. Phoenix has played pathetic characters in the past, but here he does the exact opposite. Theodore’s actions could be criticized as pathetic, but Phoenix’s performance makes those actions instantly relatable because they come from the pain of losing someone you love. There’s nothing pathetic about trying to heal from a breakup, and Samantha is the ultimate rebound. But she’s not just a virtual cushion, and Johansson is marvelous at painting a person with only her voice. She’s so expressive and emotive that we can almost see her on screen standing next to Theodore. Jonze shifts the movie through the austere, straight-edged, unyielding world of Theodore’s single life to an almost dreamlike haze when he’s with Samantha. He unabashedly throws himself into their love story to where their relationship may be viewed as unconventional, but not abnormal. His script will drop in an occasional line to explain how human-OS relationships function in the larger world, but the greater importance is how Theodore and Samantha’s relationship works and how important it is to the two of them. One character is healing and the other is learning, and Jonze brings out the beauty of those simple actions. Even at the extreme moments like Theodore and Samantha trying to find a way to be sexually intimate, Jonze doesn’t abrasively challenge our preconceived notions. He takes us by the hand, and trusts we’re mature enough to accept this love on its own terms. “Love is a socially acceptable form of insanity,” Theodore’s friend Amy (Amy Adams) tells him. This line is the closest Jonze comes to justifying the premise of Theodore and Samantha’s love. It’s a bit unnecessary because by the time Amy says it, we’ve already seen that just because this particular love is bizarre, that doesn’t make it any less worthwhile. Love exposes our strengths and weaknesses. More importantly, it grows, and even if it grows forth from an unusual place, it’s powerful and revelatory. So is Her. *Samantha Morton was the original voice of Samantha and was off-screen reading her lines to Phoenix, but Johansson replaced Morton in post-production.